Twitter has suddenly suspended an account that had posted a video of themselves laughing at Rachel Maddow crying on air over the conclusion of Robert Mueller’s investigation. 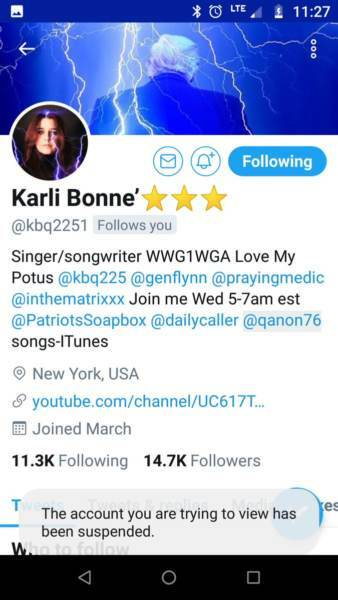 The user, Karli Bonne’, had nearly 15,000 followers when her account was removed. Bonne’s video had quickly amassed over 84,000 views. The video of Maddow crying, and the viewers cracking up, was spreading like wildfire on Twitter at the time of her suspension — though it remains unclear how she violated Twitter’s rules. As TGP previously reported, the tears came on Friday evening after it was revealed that there would be no more indictments from Mueller’s office, sealed or otherwise, which completely contradicts the tall tales that Maddow has been selling her viewers. Barely holding it together, Maddow emotionally explained that she is on a fishing trip in Tennessee and came into a studio — despite having had the day off. Luckily, there are plenty of videos of the broadcast. We have reached out to Twitter for comment about the suspension and will update this story if one is provided. 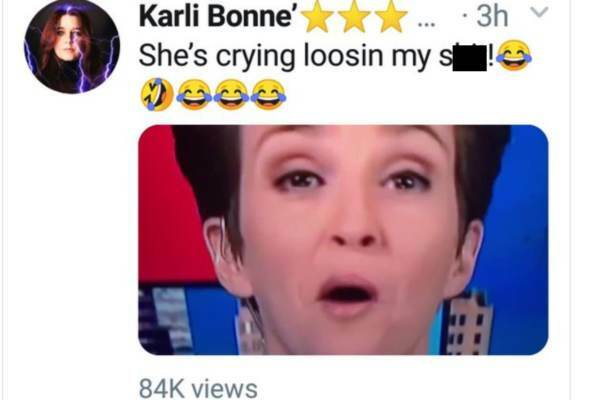 The post Big Tech Strikes Again: Twitter Suspends Account With Viral Tweet of Rachel Maddow Crying on Air appeared first on The Gateway Pundit.